Furtado, J.S. (1981). 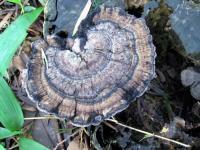 Taxonomy of Amauroderma. Memoirs of the New York Botanical Garden, vol 34. Horak & Mouchacca 1998 : 93.